Obama said Monday he wants to prevent U.S. companies from deferring tax payments by keeping profits in foreign companies rather than recording them at home. President Barack Obama promised sternly on Monday to crack down on companies "that ship jobs overseas" and duck U.S. taxes with offshore havens. It won't be easy. Democrats have been fighting — and losing — this battle since John F. Kennedy made a similar proposal in 1961. Obama's proposal to close tax loopholes was a reliable applause line during the presidential campaign, but it got a lukewarm response Monday from Capitol Hill. Sen. Max Baucus of Montana, the Democratic chairman of the Senate Finance Committee, said the plan needed further study, even though similar ideas have been around for years. The president's plan would limit the ability of U.S. companies to defer paying U.S. taxes on overseas profits. At the same time, Obama would step up efforts to go after evaders who abuse offshore tax shelters. Obama said his plan would raise $210 billion over the next 10 years, though no tax increases would go into effect until 2011. That's an average of $21 billion a year, less than a 2 percent nick in a federal budget deficit that is projected to hit $1.2 trillion in 2010. 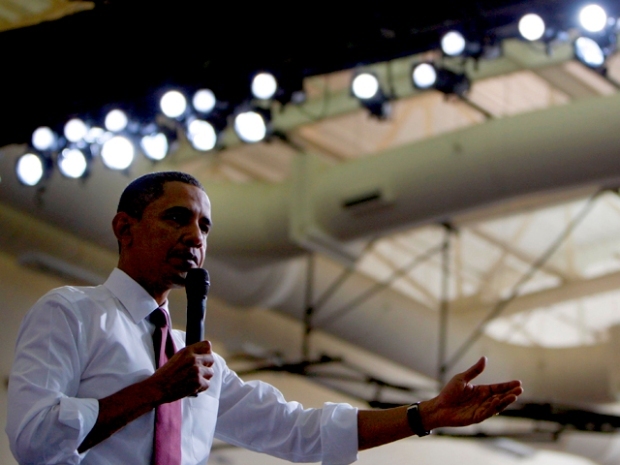 Lost revenue isn't the only problem, Obama says. He contends the current system gives companies an incentive to invest overseas rather than creating jobs in the U.S.
"It's a tax code that says you should pay lower taxes if you create a job in Bangalore, India, than if you create one in Buffalo, N.Y.," Obama said Monday. The business community argues the deferral system helps them compete against foreign companies that pay taxes only in the countries where they generate profits. "Nobody should miss the fact that this is about revenue," said Raymond Wiacek, head of the tax practice at the law firm Jones Day. "These companies have the money, and the U.S. government needs the money." Obama also proposed a package of disclosure and enforcement measures designed to make it harder for financial institutions to help wealthy individuals evade taxes in overseas accounts. Obama said the government is hiring nearly 800 new IRS agents to enforce the tax code. "I want to see our companies remain the most competitive in the world," Obama said at a White House announcement. "But the way to make sure that happens is not to reward our companies for moving jobs off our shores or transferring profits to overseas tax havens." Obama's plan would impose billions of dollars in new taxes on many of the nation's largest corporations, including Google, General Electric, Hewlett-Packard, Intel and Johnson & Johnson, tax experts said. But it falls well short of the broad overhaul of the tax system that will probably have to wait until at least next year — after Congress deals with health care and energy. In exchange for the increased taxes some companies would have to pay, Obama agreed to make permanent a research tax credit that would provide firms about $75 billion in breaks over the next 10 years. The credit currently is to expire at the end of the year. Obama has widespread support in Congress to crack down on tax evaders who illegally hide assets in tax havens. But he faces stiff opposition — even within his own party — to increasing taxes on the legal transactions of U.S. multinational companies. "To the extent the president continues on the road of cracking down on tax abuse, he can count on my support," said Sen. Chuck Grassley of Iowa, the top Republican on the Senate Finance Committee. "But if he's using tax shelters as a stalking horse to raise taxes on corporations at the cost of U.S. jobs, he'll lose me." A coalition of business groups has already stepped up lobbying efforts to kill attempts to increase taxes on overseas profits, saying it would make American companies less competitive. "We're talking about American jobs at American companies and their ability to compete overseas," said John J. Castellani, president of the Business Roundtable. At issue is the way the U.S. taxes the overseas profits of American companies. Under current law, American corporations with subsidiaries in foreign countries can defer paying U.S. taxes on the profits of those subsidiaries until the money is transferred back to this country. If companies leave the money overseas, where corporate tax rates in most countries are lower than in the U.S., they can avoid American taxes on those profits indefinitely. If the money is brought to the U.S., corporations can subtract foreign taxes already paid. The U.S. has a top corporate income tax rate of 35 percent, which is among the highest in the developed world. However, most corporate income is taxed at much lower rates because of deductions and credits. In 2004, large corporations paid an average effective tax rate of 25.2 percent on domestic income, according to a Government Accountability Office report last year. For foreign income, the effective U.S. tax rate was about 4 percent, the report said. That figure does not include taxes paid to foreign countries. —Prevent companies from writing off domestic expenses that help generate profits abroad — until those profits are returned to the U.S. and subjected to American taxes. For instance, administrative tasks performed in New York for a London office would not be tax deductible in the United States. —Prohibit companies from receiving foreign tax credits on income that is not subject to U.S. taxes. —End a provision that lets U.S. companies legally shift income from one foreign subsidiary to another, making the taxes they owe to the United States "disappear." Former President Kennedy failed to end the tax deferral system in 1961, despite telling Congress the U.S. could no longer afford it. The system also survived overhaul efforts in the 1970s and 1980s. Rep. Charles Rangel, chairman of the tax-writing House Ways and Means Committee, proposed a similar measure to limit the deductions of U.S. multinationals in 2007. But Rangel, a Democrat from New York, tied his proposal to lowering the overall corporate tax rate. On Monday, he welcomed Obama's plan. "For too long, our tax laws have rewarded companies that invest and keep their money overseas and turned a blind eye to the use of tax havens by the wealthy," Rangel said.